Diamonds are a girl’s best friend. Whether on the red carpet or on the way to work, diamonds add finesse to any look. 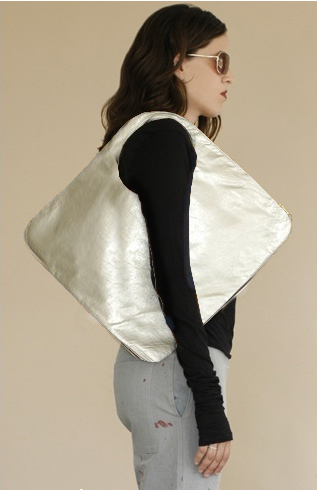 But in case you can’t afford the bling, there’s a stylish alternative – the Diamond Shoulder Bag from Arza Design. This patented bag is a super sleek marriage between fashion and function. The unique diamond shape is highlighted by a circular cut–out ‘handle’. Hidden snaps and zippers keep your items safely tucked away, while the geometric shape adds to the appeal. The metallic pearl leather is a gem in its own right, and the perfect substitute until you can afford the real thing.